Multinational Nidec Industrial Solutions (NIS) played a key role in the development of Moscow’s new cable car system that connects two focal points in the Russian capital – the scenic viewpoint at Moscow State University, located on Sparrow Hills (also known as “Vorobyovy Gory”), and the Luzhniki Stadium, the sports complex where the 2018 World Cup Final was played. The new cable car, that will make three stops, will glide 140 meters above the Moskva River. The panoramic location on Sparrow Hills will eventually become the site of an important sports area, dedicated to international events. By the end of 2018, the old ski jumping ramp dating from 1953 will have been restored and reopened. 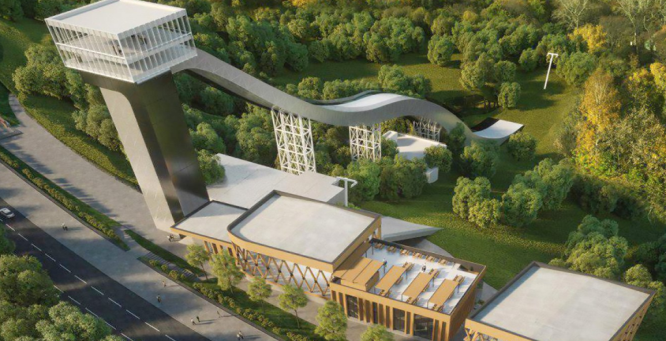 In addition to the usual passengers, the cable car will also carry amateur and professional athletes heading for the ski slopes or the ramp in winter, and, all year round, to the sporting events at the Luzhniki Stadium. The system will also constitute a tourist attraction, thanks to the views from the panoramic cable cars. The headquarters of NIS in Montebello Vicentino, a center of world excellence in the development of cutting edge systems for cableways, in conjunction with Bartholet Maschinenbau AG (BMF), leader in the mechanical lifting systems sector, has designed the electronic equipment that complies with European directives for the automation and safety of transport passenger systems. More specifically, NIS has provided the drives, motors, communication systems and wiring, support during the start up stage and the training of local operators, that is required in order to ensure that the entire facility operates flawlessly. The technology used makes this cableway system totally unique. In fact, while the cable cars travel the system’s entire route, the seats take a shorter run over the hill, thanks to a speedy exchange method. This cable car system is the third of its kind produced by the two companies in Russia. The 737-meter cable car system has thirty-five, eight-seater cable cars and will handle 1600 passengers an hour. It also has VIP Deluxe cars. Nidec ASI’s cutting edge technology and the four main drives installed, will provide variable power of between 120 and 150 kw, producing a cruising speed of 3 meters per second. The system consists of two different sections – the first overflies the Moskva River whilst the second travels to the top of the hill – with an intermediate interchange that makes the ascent and descent of the passengers possible. It will be possible to make a stop, along the route, before crossing the river and arriving at the stadium. The flow will be coordinated and managed by the control room located at the top of the futuristic Luzhniki station.